It is hard to go completely wrong with a fixed blade of good quality, and the UZI EK does have good points including 8CR14 high carbon stainless steel and full tang handle construction. The heavy blade guard is strong enough to catch and deflect an attacker's knife, and the handle slabs of G-10 will hold up in all types of weather. G-10 even resists chemicals and is a favorite material among tactical knife builders. 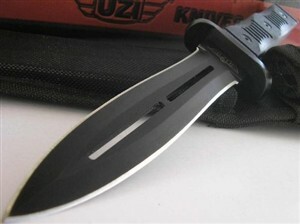 The black coating reduces the reflectivity of the knife, and all portions of the build are covered except the cutting edges. The through-the-blade blood groove does seem unnecessary and more decorative than functional. Construction of that type weakens the blade without doing much to lighten the load of this 10-3/4-inch tactical fighter. The double-edged, 5-7/8-inch blade also limits the camp uses of the EK, since there's no place to rest a thumb for top pressure. String a lanyard through the hole in the handle if you like, but the only way to safely carry this dagger is in the nylon fabric belt sheath. A plastic liner protects the sheath from the blade, and the stainless high carbon steel should not be bothered by moisture, which is certain to collect there. Overall, this Chinese-made tactical dagger seems a little light for tactical users. See the Boker-Schanz Integral Dagger for a functional fighting knife that's all business.